Gender identity: What’s it like to be transgender? What’s It Like to Be Transgender? 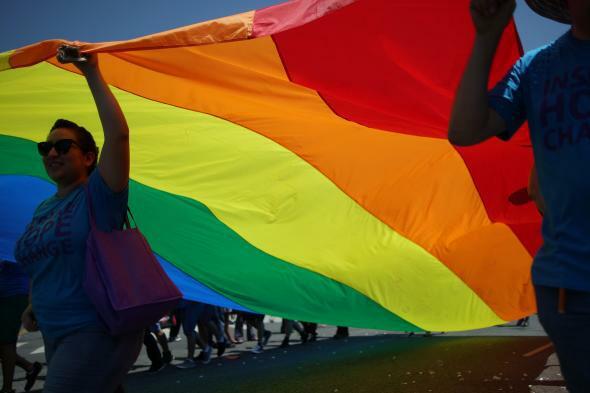 Marchers carry a rainbow flag in the L.A. Pride Parade on June 8, 2014, in West Hollywood, California. What does it mean to feel like you’re something other than the gender you were identified as at birth? I can only answer for me. When I was 3 or 4 years old, I wondered why I couldn’t play with the other girls at day care. At a young age, I genuinely didn’t understand why I was different from the rest of the girls. When I was 7 and I went to a birthday party for my neighbor’s children, I gave gifts to both the young girl in the family (my age) and the young boy (a year younger). The gifts were toys about as gendered as you’d expect, but I was far more interested in playing with Melissa and the toys she had than playing with Mark and the toys he had. All through grade school I didn’t “play right.” I never fit in with the boys, no matter how hard I tried. Oh, I was in Boy Scouts, and I had GI Joes, but that didn’t make me fit in with anyone. The games the boys played felt … off. Instead, I read Anne McCaffrey’s Dragonriders of Pern and shared the books with the other girls in my class. Our heroes were Menolly and Lessa, and we made origami fire lizards in all the different colors. When puberty happened (sort of) I looked at adult women and thought, “I wish I could grow up to be pretty like her.” Testosterone and I had only a passing familiarity through high school, and until college I didn’t need to shave more than once a week. I was happy with that. It meant that I could wear a size 6 in most things and the cultural pressure to be slender impacted me more than the cultural pressure to be muscular. When I got into online gaming (text-based RPGs), people assumed I was female. Not because I played female characters, but because I acted like a woman. My best friend, bless her heart, never outed me. You can generally tell when men are playing female characters, but no one ever took me as anything other than a woman. That was a greater blessing than I appreciated even then, and a part of me died a little bit when gaming communities moved more and more toward voice chat because I wouldn’t ever be taken as “one of the girls” anymore. In college, when I went out shopping with girlfriends (friends who are girls, not romantic partners), I was every bit as excited as they were to hunt for a new cute outfit, and that I cried a bit inside because I could never wear those things—and even if I did, I wasn’t built for them. Something as simple as putting on a bra in the morning was a moment of sadness because there was something missing that should be filling out those cups, and my body was never going to give me that something if I didn’t do something about it. As I grew older and testosterone finally caught up with me, I saw more and more of my father in the mirror—and that I hated my reflection more and more every day. No matter what I did, I was never “one of the guys.” I was never comfortable in large groups of men, but as I grew older, I was less welcome in groups of women. I had become an outsider to the people who I felt the most kinship with. It means all of those things and so many more that I can’t describe. But I can tell you one more thing it feels like: When I stepped out into the world in a suit and tie, I felt like I had constructed a layer of armor around myself so the world could see the man I was supposed to be. I felt the weight of it on my soul. Now that I’m free of that armor, and I feel like I can fly. Transgender: I want to start my transition from male to female. What should I do first? Transsexuality: If the goal for trans people is acceptance for their true gender, why publicly identify as trans? Transgender: How/when did you know you were not cisgender?